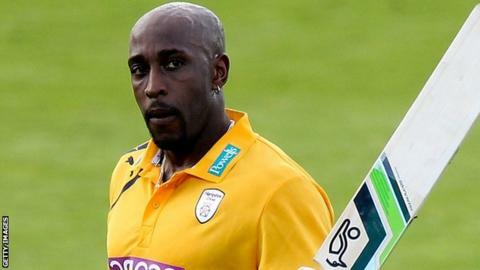 Hampshire opener Michael Carberry has joined Perth Scorchers for the Big Bash season, which starts on 18 December. Carberry, 34, was Hampshire's second-highest run-scorer in the 2014 T20 Blast campaign, as the county reached their fifth consecutive T20 Finals Day. He joins the current Big Bash champions alongside all-rounder Yasir Arafat, who will play for Hampshire next year. "It's really exciting, this feels like a new phase of my career now," Carberry told BBC Radio Solent. Carberry revealed he had been due to join Perth last season, but had to pass on the opportunity because of his commitments with England during the doomed 2013-14 Ashes tour of Australia. He said he believed the forthcoming experience could improve him as a batsman and felt spending the off-season in Australia was the best option at this stage of his career. "The conditions in Australia are a lot different, you are dealing with more pace and bounce so I'll need to modify my game. It's one of the best run tournaments in world cricket, it's exciting. "Perth have had a fantastic phase, they have won it twice and been runners-up. It's a pretty similar set up to Hampshire and hopefully I can take some of my experiences here with Hampshire and go over and be open minded about playing out there. He added: "I've just turned 34 and I'm a firm believer in keeping the engine running. "Spending winters at home does not have as much benefit to me as it used to. I think getting out there and keeping the body fit and playing you learn a lot more. I want to make the last years of my career as successful as possible." Carberry also hopes he can change the perception cricket fans in Australia may have of him after the 2013-14 Ashes series in which England were whitewashed 5-0. "I enjoyed batting out there," added Carberry. "I learnt a lot from that experience, I want them to see a side to me they didn't see during the Ashes. We were getting beaten every game but I took what positives I could out of it."